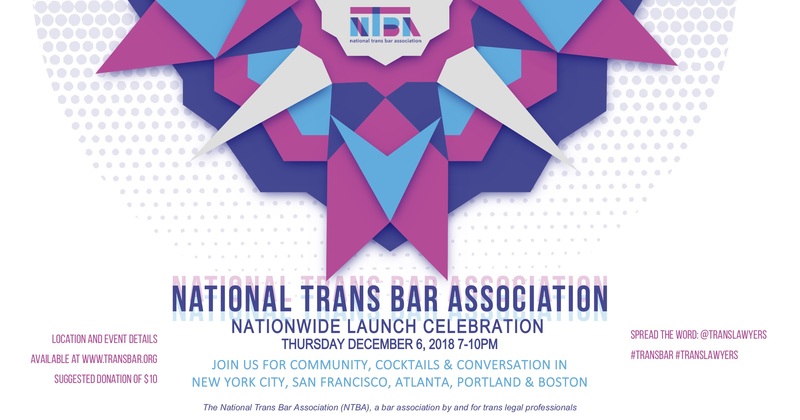 The National Trans Bar Association (NTBA) is pleased to invite you to our Nationwide Launch Celebration, Community, Cocktails, and Conversation, taking place Thursday December 6, 2018 in five cities — New York, Boston, Atlanta, Portland, and San Francisco. Come connect with transgender and gender nonconforming, and allied lawyers, law students, and legal professionals from across the country and learn all about the benefits of joining NTBA, including our new mentorship program, and what we have planned for the new year. Suggested donation is $10. RSVPs are stongly encouraged. * The Portland Event is being held in partnership with the Oregon Trans Law Caucus. A limited number of travel scholarships are also available. Contact esquivel1217@yahoo.com for more details.